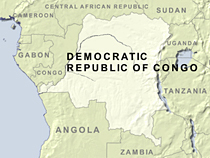 A journalist rights group is calling for a retrial in the Democratic Republic of Congo after four men were convicted Tuesday by a military court of killing a journalist and sentenced to death. Congolese police officials say justice has been served, but Reporters Without Borders says the trial has been a farce. Selah Hennessy reports from the VOA West and Central Africa Bureau in Dakar. The four men were found guilty of murdering Serge Maheshe, a U.N. radio journalist who was shot dead in the eastern town of Bukavu in June. Two of the men, both demobilized soldiers, have been sentenced as assassins, while the other two are said to have ordered and organized the murder. General Gaston Luzembo, the chief inspector of police in South Kivu, says it's normal for some people to be unhappy about the sentencing, but he says the law has done its job. But Reporters Without Borders, the Paris-based international organization that advocates freedom of the press, says the verdict is absurd. Spokesman Leonard Vincent says the two men convicted of ordering the killing, Serge Muhima and Alain Mulimdi Shamavu, were close friends of Maheshe and were with him when he was murdered. Vincent says the two will appeal the verdict. "What we believe is that this verdict is completely absurd and that something has to be done to start from scratch and redo this whole trial," he said. He says the trial, which began only a day after the murder, has been plagued with problems from the beginning. "The trial started the day after the killing with no ballistics expertise, with no examination of the crime scene, with no confrontations of the various witnesses," he added. He says no evidence has been produced to prove that the two journalists organized the murder of their friend or that they had any motivation to murder him. Maheshe, the U.N. reporter, was one of at least four journalists murdered in the Democratic Republic of Congo since 2005. Patrick Kikuku, a freelance photojournalist, was killed by unidentified men in August, only two months after Maheshe's murder. Vincent says despite the killings, the government of the Democratic Republic of Congo has done very little to improve the safety of journalists. "Nothing serious has been done about these killings," he explained. "When they are attacked or even killed, justice has never been done for them." The world's largest journalist union, the International Federation of Journalists, says that after Somalia, the Democratic Republic of Congo is the most dangerous place in Africa for journalists.